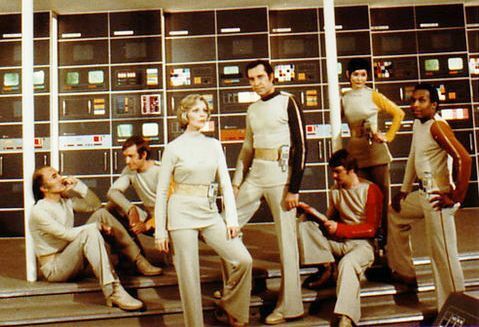 Things were so different in Space 1999, weren’t they? Hope you haven’t altered the decor too much either; I know my relatives had loads of those designs a good 20-odd years before you kitted your place out – hell, maybe your interior designer found their cast-offs in the local paper. Or maybe he just went to IKEA. I can’t think why they would have given them away, they must be worth a fortune now. But I do wish I’d got hold of one of your little communicator / door opening devices too but they never took off back here. I made one out of Lego, though. Nor were the stunner guns a big success, but they were very dinky too, I still want one of those too. Anyway, hope all is well, Commander Koenig, Dr Russell, Alan Carter, Professor Bergman and whoever else is still there, wherever ‘there’ is – we on Earth miss you lots. P.S. What a great tune you had too. This entry was posted on September 13, 2010 at 8:20 am and is filed under Geeks, Star "Style", TV. You can follow any responses to this entry through the RSS 2.0 feed. You can leave a response, or trackback from your own site.